Bob Nunley & Elmer Green enjoy talking about intuition! Who are Elmer Green and Bob Nunley? In the summer of 2012, Elmer Green and Bob Nunley asked if I might channel some information for them from All That Is. Channeling is a process wherein I first contact my own higher wisdom (higher self) and then continue beyond that connection to a place where other energies exist. These energies, which make up a collective wisdom, call themselves All That Is. When I ask questions I receive answers that are beyond my own personal intellectual knowledge. You could see this process as an advanced form of intuition. Channeling can be a refreshing and important approach to gathering information. I have been doing this since I was a child, but I have only recently used it for research. Channeling is actually the basis for our upcoming book, which will be released soon. 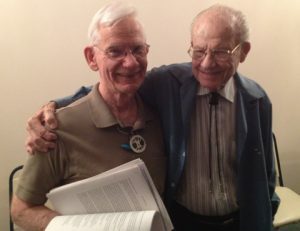 To give you some background on Elmer Green, PhD, he founded the Voluntary Controls Program at the Menninger Clinic in Topeka, Kansas in 1964. He cofounded the Association for Applied Psychophysiology and Biofeedback (AAPB) in 1969 and cofounded the International Society for the Study of Subtle Energies and Energy Medicine (ISSSEEM) in 1990. You may have read the classic book he co-authored with his colleague and wife, Alyce Green, titled Beyond Biofeedback. Robert Nunley, PhD, is the Dean of Faculty at Holos University Graduate Seminary, Professor Emeritus of Geography at the University of Kansas and the past co-president of ISSEEM. He was also the chair on my committee at Holos where I recently completed my Post-Doctorate of Theology in Spirituality and Holistic Health. Channeling further information on intuition was my topic of study. Greg and I will now be teaching a course on intuition at Holos. Question: Elmer likes the quote from the Theosophical Society which says, “No one goes up to heaven who did not come down from heaven in the first place.” What does All That Is think of that statement? All That Is Answers: This is a curious statement. It means that you look up to Source and down to your physical experience. May we suggest that your experience is more encumbered by your own rationality than you realize. If you were to consider that Source is within, there would be no going up or going down, now, would there? However, in the understanding that Source is light and bright, you could conceive of it as your sun – as your Source for movement and growth. The beauty is that, as a being, you are whole. You are meant to be here in this existence experiencing yourself. The more you do this, the more you grow, change, blossom and return home to who you are. When you leave Source, you forget who you are. May we suggest that you do your part to remember who you are. You return slowly, but surely, in many ways to Source. Death is not required. In other words, you can go up and down the scale of existence without having to wonder if you are returning to Source correctly. Why not simply enjoy the journey? The Theosophical Society may reprint this saying many times because people can relate to up and down. The up, you could say, is more of a vibrational frequency that is subtler and, therefore, more filled with light. The down is more in disgrace, or in lack of grace, of who you are. Therefore, you could see down as clouded in meaning and darker in existence. So, as Elmer says, you must come down to go up. Truly, it means that you must first experience yourself as a part of God, God (creator) in your realm, and then return home once again. However, most people do not remember this. They forget. Therefore, their return journey takes quite a while. Your prodding is paying off. The lightness is within you and the return is sure. The enjoyment of it is to be had at this time – with or without the experience of what you call heaven. Question: Elmer would like to know that the grass is greener on the other side and that all of our “trampling around” in this lifetime pays off. All That Is: The connection to Source is what it is all about. May we suggest that this channeling has as its purpose to assist you in the return home – the remembering of who you are. This is the path for all of you at this time. Bob has experienced joy in his heart in a way that many have not. If he can tap into that and share that joy that he experiences with others, then he will bring forward the light and the love to share with others. He is a truly light centered vehicle that swings about and touches others with his fluttering wings, you could say. These gentle movements affect people in ways that he does not know, but he glimpses. The more that each of you allows yourself to be yourself, the greater your gift will be. In other words, enjoying who you are and sharing can be meaningful and beneficial to many. Bob: Yes. And I have a strong feeling that these forthcoming channelings on intuition will have an impact on many. I have been working with some people about the escalation of consciousness, and I think that we are right on track with something that is desperately needed. Well, we are all here to serve, and All That Is is a big part of what that is all about. Thank you! Read Elmer Green’s classic book, Beyond Biofeedback.